Jain figure from Kanchipuram. Made into an engraving and published in AR (9) 1809, opposite p.272. bl.uk > Online Gallery Home	> Online exhibitions	> Asia, Pacific and Africa Collections	> Jain figure from Kanchipuram. Made into an engraving and published in AR (9) 1809, opposite p.272. Watercolour drawing dated 18th August 1799 of a Jain statue from Kanchipuram, from an Album of 56 sheets of drawings mainly of miscellaneous architecture and sculpture in the Deccan and S. India, dated 1793-1806. The drawing was engraved for C. MacKenzie, 'Account of the Jains', 'Asiatic Researches,' vol.9, 1807, opposite page 272. Colin Mackenzie (1754-1821) was the first Surveyor General of India. Originally from Scotland, he came to India in 1782 as a member of the Madras Engineers. He took part in numerous map surveys, mainly in Southern India, before he was appointed to the post of Surveyor General in 1815. During his surveys in South India he collected and recorded innumerable details concerning every aspect of South Indian history, architecture, language, life and religion, resulting in possibly as many as 2,000 drawings and over 8,000 copies of inscriptions. 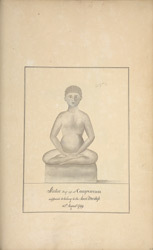 This drawing depicts a naked seated Jain figure.